THE SMITHS - "CEMETERY GATES"
MARILYN MANSON - "THIS IS HALLOWEEN"
THE FLAMING LIPS - "HALLOWEEN ON THE BARBADRY COAST"
Este mês o Posso Ouvir Um Disco? leva ao mundo uma banda que não é uma banda, os Pernas de Alicate, é mais um projecto multimédia, no sentido analógico da palavra, comandado por Carlos BB e Sara Feio e seguido por uma série de amigos de outras áreas (fotografia, filme, música) para construir sobre a sua base. Nos temas, Carlos BB geralmente começa na bateria e, a partir daí, os músicos amigos, e companheiros de estúdio, vão adicionando camadas assim como, noutras áreas, vão nascendo obras de filme e fotografia paralelamente. Para já temos uma invulgar obra musical e uma interessantíssima obra de imagens estáticas e em movimento, e uma grande vontade de MUITO MAIS. Além dos Pernas de Alicate, temos mais 20 temas e bandas nesta edição do Music Alliance Pact. Clique com o botão direito do rato, por cima do título da canção, para fazer o download do mp3 ou faça um download do ficheiro completo, com os vinte e dois temas, através do Dropbox AQUI. PORTUGAL: Posso Ouvir Um Disco? 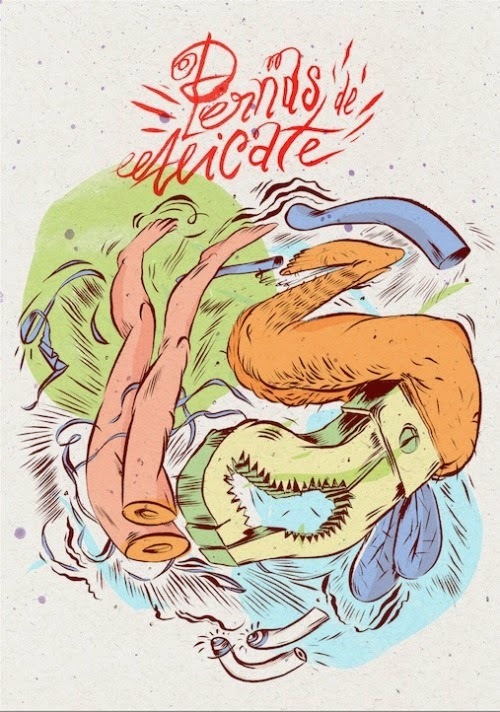 Pernas De Alicate - Pássaros (Casa Para Pássaros, Parte I) Pernas De Alicate is not really a band but a project started by drummer Carlos BB, who is also a recording studio owner, and Sara Feio, an illustrator. They invited some of their friends and acquaintances to contribute their art, music, illustrations, photography and film for Pernas De Alicate. The music was recorded over Carlos BB's drums, with every musician invited on a one-by-one basis. The video for Pássaros (Casa Para Pássaros, Parte I) was directed by Sara. ARGENTINA: Zonaindie Ubika - Fahrenheit Hard rock guitars, solid bass and drums plus strong female vocals are the formula behind Ubika. Fahrenheit is the first single from their latest album, Amigos Del Bosque, and it's inspired by Ray Bradbury's novel. The song has a video directed by Diego Stickar, which you can watch here. AUSTRALIA: Who The Bloody Hell Are They? The Twoks - First Light The Twoks are a Melbourne two-piece comprising Xani Kolac on violin and vocals, and Mark Leahy on drums. Initially the solo instrumental project of Kolac, who studied jazz and improvisation at Victorian College of the Arts, the duo is now renowned on the local live circuit for their unpredictable sets which feature Kolac on loop station and a smorgasbord of effects. On The Twoks' latest release, First Light EP - which boasts crisp production from Tony Buchen (The Preatures) - Kolac's improvisations have been whittled down to concise retro-pop tunes in the vein of Pat Benatar or Kate Bush. BRAZIL: Meio Desligado Baleia - Breu Breu is one of the strongest songs from Baleia's debut album, released last year. They first caught the attention of the indie press in Brazil with a jazzy cover of Justin Timberlake but in their album they show a handful of influences, resulting in experimental indie-rock that dabbles in baroque pop and folk. CANADA: Ride The Tempo Friends Forever - As Long As You Call Me The duo of Jordan Pearson (New Zebra Kid/Halcyon) and Sam McDougall don't have many songs yet under the moniker Friends Forever, but As Long As You Call Me shows off vintage 80s synth-pop inspiration with sparking melodies. CHILE: Super 45 Magaly Fields - Love Scene Magaly Fields is a duo formed by Tomás Stewart (guitar) and Diego Cifuentes (drums) who rock fast and strongly. They released their debut album Chromatic Days in September through Algo Records. Their first single is Love Scene, a fictional tune about a rotten relationship that fantasies that the romance never really happened. DENMARK: All Scandinavian Hit The Hay - Long Way Home One of my favorite Danish bands right now, Hit The Hay travel dusty American roads with bags packed with catchy Scandinavian melancholy. Here is my first meeting with them, Long Way Home, as a MAP exclusive download, but do also check out the great Never Wanted Out and Running. DOMINICAN REPUBLIC: La Casetera Doob - Put On Your Seat Belt (Brenda M Remix) True island vibes can be felt all over the work of Doob, a young producer from La Vega who spends his time remixing, and ranging between soul and progressive house on tracks of his own. The original Put On Your Seat Belt song can be heard here, but the one featuring on this MAP edition is a Nu-disco remix by Brenda M, a DJ and collaborator from the neighboring Santiago province. ECUADOR: Plan Arteria Estereo Humanzee - Insaciable In less than one year, Estereo Humanzee return to MAP with their new EP, 8min 20seg. This three-song EP, that came with their new live album Signaux Lumineux, is a real statement of the evolution of their electronic sound. FRANCE: Your Own Radio Singapour - Paris SA Singapour is the new project from the duo Mondrian, who are composed of Roman Oswald and Lee Gordon. On their track Paris SA (Paris Société Anonyme) they present the Paris you don't really want to know: €10,000 per square meter, €3 coffee, stressful life. It's the storytelling of a complicated relationship between Parisians and their city, a kind of "I love you… me neither". GREECE: Mouxlaloulouda Dead Gum - Float Panagiotis Spoulos, as Dead Gum, mainly uses guitar and vocals through minimal effects to create instant songs, psychedelic collages and direct, stripped-down bursts. The music itself - partially improvised but fully psychographic - has anthropocentric characteristics and lo-fi character and flirts with punk, bedroom pop and analog noise. Float is the gripping opening track off his upcoming album, GAINER. INDONESIA: Deathrockstar Megatruh - Annelies Megatruh come from Malang, a small city in the eastern part of Java with plenty of music talent, and Megatruh is one of the latest breed. After a series of painful things happened to frontman Kidung, he started a project influenced by post-punk, psychedelia and noise-rock with 90s sensibilities. IRELAND: Hendicott Writing Conor Walsh - The Front West coast modern-classical pianist Conor Walsh has one foot in Ireland's contemporary scene through his toned-down samples and nuanced electronics. In the most part, though, his music exudes a mellow timelessness, taking the gorgeous throwback farmland of rural Mayo and converting it into a sound that's part film score, part desolate romance. At first listen this sounds like simple piano music; let it sit and The Front's gentle flow whisks you away. ITALY: Polaroid Niagara - Vanillacola Niagara are a Turin-based experimental pop duo. They say their sound incorporates elements of electronic, psychedelic, Eastern and dance music, but I think it's more surprising than this. The track Vanillacola, from their second album Don't Take It Personally (out now on the UK label Monotreme), is a wonderful example of Niagara's elusive idea of music: Boards Of Canada synths that destroy a catchy pop structure, while the vocals become more obsessive as the melody gets hypnotic. JAPAN: Make Believe Melodies The Somedays - Remember Me There is no shortage of indie-pop music in Japan. There has never been a lack of twee-leaning, ennui-dunked groups in this country. Osaka group The Somedays have found a smart way to stand out from the pack. Remember Me is anchored by all the regular trappings of the style - guitar, drums, melancholy vocals - but is given a buzzy edge thanks to the presence of synthesizers, lending a futuristic vibe to their sound. MEXICO: Red Bull Panamérika Pájaro Sin Alas - Alfombra Mágica Mental Rodolfo Ramos Castro aka Pájaro Sin Alas ("Bird With No Wings") not only penned one of the most heartbreaking songs of the first half of this decade, but also became a figure whose slow output is worth the wait. Alfombra Mágica Mental functions as bitter sips of shared realities that strangely link the mystery of the Arabian Nights with the barren landscapes of his home state of Chihuahua in northern Mexico. PERU: SoTB Las Amigas De Nadie - Should Not Let It Go Human Dress is the new album of Las Amigas De Nadie, released two years after Sincronia, a record that created great interest in the Latin American music scene thanks to its originality. Human Dress gives us a much deeper insight into the experimental melodies that the band introduced in their previous album. Should Not Let It Go is their first single, an addictive and remarkable mix of electronic textures and distorted vocals. PUERTO RICO: Puerto Rico Indie Samalot - Valle De Luz After two intense albums as part of experimental rock group Tachdé, Fernando Samalot has created his own niche in the prolific Puerto Rican music scene with his introspective and meditative songs. With the steady hand of engineer and producer Héctor "Stontape" Hernández, Fernando has created musical landscapes filled with desire, hope and wisdom that seem to travel like wind from our lush Caribbean mountains down to the intricate river channels of the island. Samalot's most recent EP - available through Bandcamp - features two "sister" songs, Rayo De Luz and Valle De Luz. Both are definitely faces of the same coin. SCOTLAND: The Pop Cop The Xcerts - Pop Song The Xcerts have been my favourite Scottish rock band since their debut album In The Cold Wind We Smile was released in 2009, with its impassioned choruses and gripping moments of melancholy. It wasn't difficult to fall under its spell. While the follow-up record was deliberately rougher around the edges, their imminent third album, There Is Only You, out on November 3, is an exhibition of The Xcerts' songwriting strength. The melodic explosion of the aptly-named Pop Song, a MAP exclusive download, is a case in point. Check out the video for it here. SPAIN: Musikorner YDVST - 2044 YDVST breathes mysticism and irrealities. His first EP, DVST / CUTS was written during silent and uncertain nights. It was released by the Sweat Taste label and contains experimental essences of ambient, downtempo and vaporware. This mysterious yet captivating artist from Madrid will certainly develop his projects at his own pace. UNITED STATES: We Listen For You The Fervor - Moment Of Truth Louisville, Kentucky's The Fervor mixes in lush orchestration with pounding vocals that conjure up thoughts of Neko Case. The music is filled with small moments of beauty that once heard as a complete piece results in a blissful listen.